Veggie 101: Eggplant and Portobello "Burgers"
Another recipe I was hesitant to try, due to my aversion to mushrooms and eggplant...but this was surprisingly good and left me wanting another one (too bad cut eggplant and tomatoes don't keep well). I used a vegetarian Angostura Worcestershire sauce (regular kinds contain anchovies), and I think this is what gave the vegetables their amazing flavor. 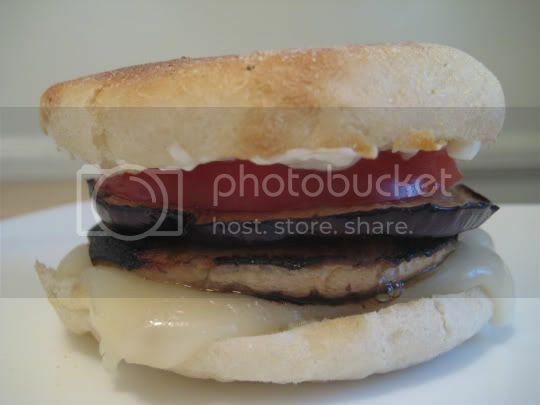 I cut the huge portobello to fit the English muffin, but I probably could have used the whole thing had I used an actual bun. The mushroom was sauteed, and the eggplant was baked, but I think broiling (or grilling) both of these would have added a nice smoky flavor. I believe this was my first time using Fontina cheese (and boy am I pissed...after searching three different grocery stores before finally finding it for $9 a wedge!!! ), but I could have easily substituted Monterey Jack, Swiss, or even Cheddar. The cheese and mayo combination made this sandwich almost comfort food-like: hearty, savory, salty...truly a "burger." Make again? Definitely. Maybe with mustard and crunchy lettuce next time for the true burger feel. I see lots of other variations possible for this recipe (BBQ burger, teriyaki burger, etc. ).